I got my Sideshow Dracula from TNC universe, preordered, so he was only $26.95 with shipping. If he shows up at the local Suncoast, that'll be about the same price including tax ($24.99) I believe Sideshow lists him for $29.99 online. 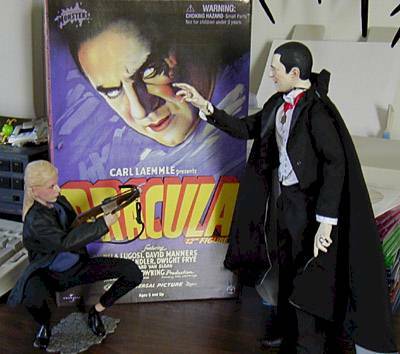 Drac was a VERY anticipated figure here, because I have all of the smaller universal monster smaller figs, but no Dracula. My expectations were high, and I'm notoriously price conscious, and typically picky. I do LOVE this new figure addition. Keep that in mind! The artwork on this package is FANTASTIC, and the images chosen are outstanding! They went back to the "Frankenstein" style of box, with the flap. It was almost too pretty to open. 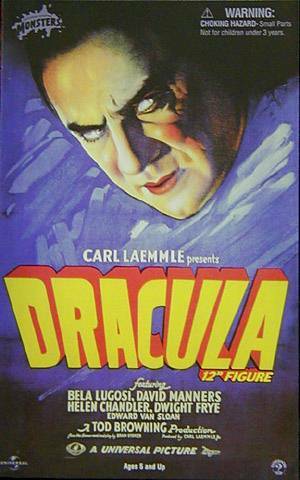 The back has a large close-up of Dracula's face from the movie, in black and white, and the front is what looks like a movie poster reproduction, but with nice, crisp colors. The sides are deep red, with brick patterns, and Dracula written in a very neat old English typestyle. Only downside, (loosing them a FULL star) is they STILL haven't gotten rid of the glued down plastic for the accessories *sigh* some day soon??? I'm not a package saver, but might even scan parts and make a wallpaper out of it! For some reason, Drac doesn't look quite as menacing as I think he should. Maybe it's the particular expression they chose, the angles the original movie was filmed in, or maybe it's that his face looks a tad wide to me. (He does look correct when comparing him to his back picture.) His hands have very dramatic poses, and his shoes look like new sculpts to me. My first impression was that his head was a tad large, but after adding the cape, he looks alright. Comparing his head to Buffy's makes his look about 1/5 larger. A side to side comparison to the 21 century mercenary in the son of Dracula shows this better. The general paint application isn't bad at all. Close inspection on my Drac showed that the shadows under his brows aren't fully painted, but look like they are supposed to be. The face has blushed cheeks, and a blushed forehead... this almost gives him an odd suntanned look. The color selection is appropriate though. His hands also have some of the same "suntanning", but something somewhat disappointing, is that the forearms aren't molded in the basic color, but are the usual body pinkish color. My drac already has the paint rubbed off on his wrist joint. Simply coloring the forearms the main color would have fixed this. 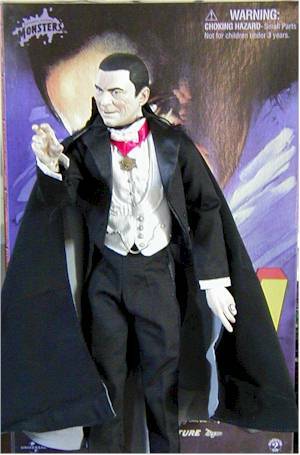 I can't knock off a whole half a point here because of the ball neck joint, but adding an additional ball at the base of the head would have given drac MUCH better dramatic head poseability. Sideshow is well known for their outstanding articulation, but they seem to miss the mark by just a hair quite a few times, with the poor choice of one joint here or there. It's a choice of adding that visible joint, lowering the basic appearance, or adding it, and raising the poseability. I'd have made the later choice, with Drac. Still, he's fangs down the best that's out there, in 1:6 scale. 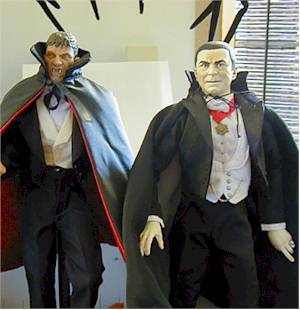 I'd much rather have seen them add Dracula's Candelabra instead. It would have been unique, and allowed for that famous Staircase pose. Bats are pretty easy to find especially around Halloween. Oh! and a nice small plaque Added to these bases would be nice as well! We've seen some skimping on outfits of late, and Drac is no exception. Fortunately, what they did do comes off very nicely. First off... if your Drac doesn't look like he has his cape, DON'T RETURN HIM! Look under the base in the package. Notice it's got a black square behind it? It's his cape folded up behind it! I almost emailed TNC that my Drac had no cape! Packaging it this way also does not really do the figure justice. MIB collectors might be a tad disappointed, that his cape is bundled this way. I'm guessing a few mistaken returns because of this. The vest, shirt, ribbon and medallion are all one piece. Making the separate might have made Drac a tad bulky, so I can forgive the lack of a separate vest. They also added very nice stitched detailing on the vest edges, making it actually look like a separate piece. Why they didn't make his medallion and ribbon a separate removable thing is an odd decision, IMHO. As you can see on mine, the ribbon is a tad off center, though the medallion is centered. The vest buttons and chain are excellent additions though. 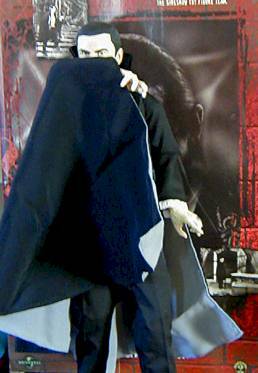 His cape is also done very well, with the gray liner, and his pants have an excellent cut. the overall presentation of the outfit looks VERY nice, even though some corners have been cut. In addition, they did a very god job at Drac's ring, and shoes as well. While I REALLY like this figure, the initial impression of the large noggin is still bugging me. On his own, he looks fine, but alongside Frankenstein, the size just looks large. I'm REALLY happy with buying him, and content with the pricepoint, I really don't plan to undress him much, so the outfit decisions are fine with me. The extra neck joint REALLY would have been nice. A nice plus, is that Drac CAN be posed in his classic "cape over the lower face" pose. Also, in this case, I'm glad I don't have the black and white variation.. having the red ribbon on him makes his outfit standout. 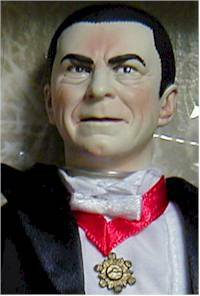 Now we need a Vampira, and a Tor Johnson figure, for the Plan 9 from Outer Space geeks! Well, I believe he's sold out at Sideshow. Suncoast seems to be getting all the 12" figures in, so that's a good local bet. TNC online got mine here quickly, and in great shape. Pre-ordering Sideshow 12" figures there saves you about $5 there as well. Figure from the collection of Gareee!